I think every household is struggling with the increase cost of living. The items at the grocery store seem to cost a little more or shrink in volume every week. 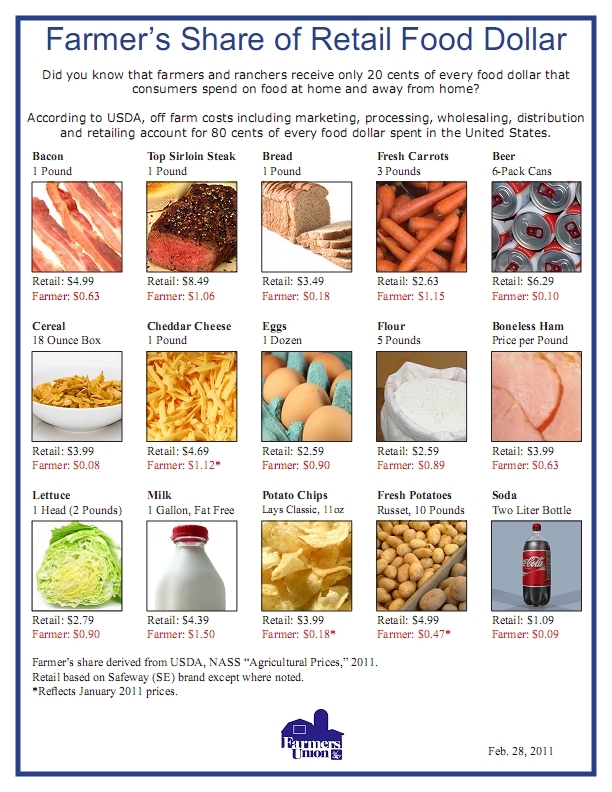 It is important to understand that the real share of the Retail Food Dollar for the Farmer is only 20 cents. According to the USDA, off farm costs such as transportation, marketing, processing, wholesaling, and retail account for 80 cent of every dollar spent on food in the United States. The Growing Season for U.S. Crops has been very challenging. It seems that every region has faced large weather related obstacles: Flood, Drought, Fire, Hurricane, Tornado. Weather is one thing farmers cannot predict or control. For my personal geographic region, we experience a very wet spring that turned into a drought over the summer months. Therefore, our are is producing less corn and soybeans. The press wants to blame the ethanol industry for the hight price of food. Every year the real cost of the food you buy is direct reflection of the costs of each step from the farm to a product you buy in the store. In addition for 2011, the shortage of crops due to the weather obstacles will also increase the cost. It is simply supply and demand.